The developer behind San Francisco’s Parkmerced megaproject expects to start construction on the first new buildings in the first half of this year. Parkmerced Investors LLC plans to break ground on nearly 1,000 units after months of permitting delays. The 152-acre development, approved seven years ago, calls for 5,679 total new units. That’s the most new housing ever built in a single project on the city’s west side. Parkmerced already has 3,221 apartments, and 1,538 existing rent-controlled units in the project will be replaced. Fifteen percent of the new units will be affordable. Parkmerced Investors LLC’s members include Maximus Real Estate Partnersand 601West Cos. 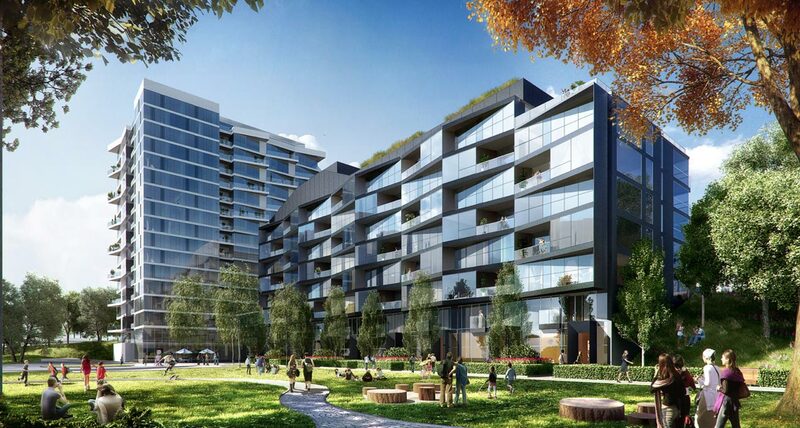 The project will have both new rentals and condos. The exact mix is still being worked out. “Site permits are being finalized and we’re gearing up for an anticipated construction start in the first half of 2018. We look forward to making great strides toward our goal of transforming Parkmerced into a vibrant ‘eco-neighborhood,’ as well as doing a large part to make the late Mayor Ed Lee’s goal of building 30,000 new homes a reality,” said P.J. Johnston, a developer spokesman. 1208 Junipero Serra Blvd., a 299-unit, 17-story tower with an estimated construction cost of $131 million. DLR Group | Kwan Henmi is the architect. 455 Serrano Drive and 850 Gonzalez Drive, 248-units in 11-story buildings with an estimated construction cost of $91.5 million. Woods Bagot is the architect. 300 Arballo Drive, an 89-unit, eight-story building with an estimated construction cost of $31 million. LMS Architects designed the building. An additional 329 units at 21 and 25 Chumasero Drive and 64 units at 99 Vidal Drive are also planned, but it isn’t clear if permits have been approved. Fourgeron Architecture designed 99 Vidal Drive. SOM is the architect for 21 and 25 Chumasero Drive, and the firm is also the master plan architect of the entire Parkmerced addition. Webcor Builders is the general contractor. Initially built in the 1940s and 1950s, Parkmerced is one of the largest single-owner housing complexes in the country. Plans to more than double the housing have experienced multiple setbacks. The Board of Supervisors approved the project in 2011, but it was delayed by a lawsuit. A new investment group led by 601West Cos. bought a controlling stake in 2014, valuing it at $1.35 billion. Construction on the first new buildings was slated to begin in 2015, and then pushed to 2016. San Francisco’s largest housing projects, including Parkmerced, Treasure Island and Schlage Lock, have faced months of permitting delays, the Business Times reported in September. Multiple city departments including Planning, Building Inspection, Public Works and Fire have to sign off on permits. The projects all include new infrastructure like streets, sewage and power lines, which complicates permit reviews. Parkmerced will include Muni upgrades. City records show that Parkmerced’s new buildings filed for permits in 2015, but were only approved last month. In one of his final orders, Mayor Ed Lee told city departments to speed both project approvals and building permits in September.